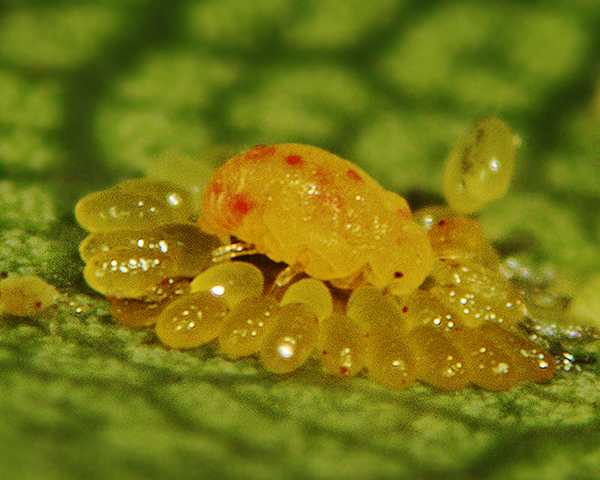 The micrograph below show an adult Phylloxera glabra with her nymphs, in alcohol. 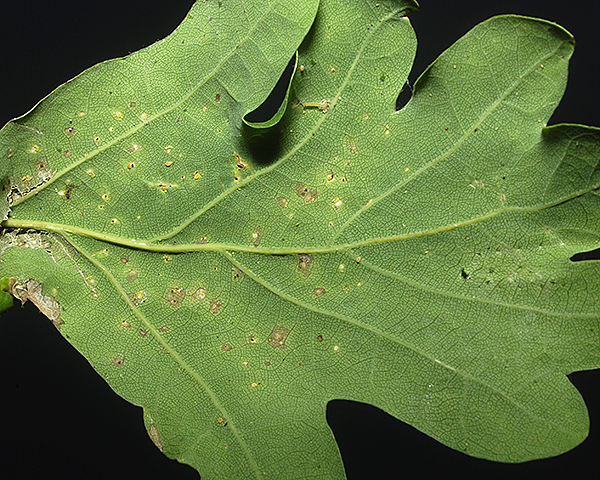 The oak leaf phylloxera overwinters in the egg stage in crevices in the bark of oak trees. 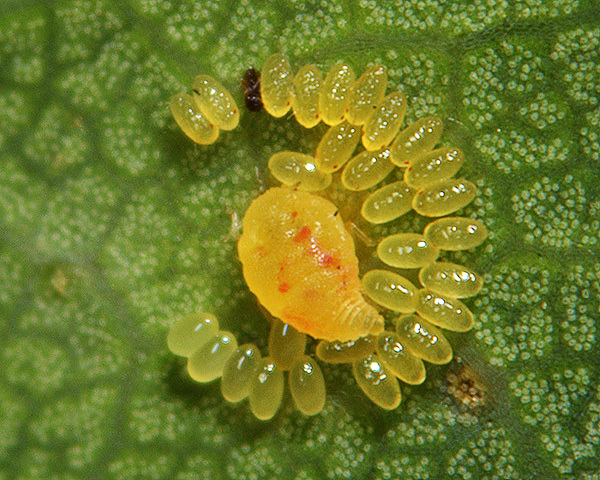 The eggs hatch in spring and the nymphs feed on the underside of leaves. Lubiarz (2001) also found them overwintering as larvae in bark slits. Once mature the adult apterae start to deposit eggs in a circle around them (see picture below). 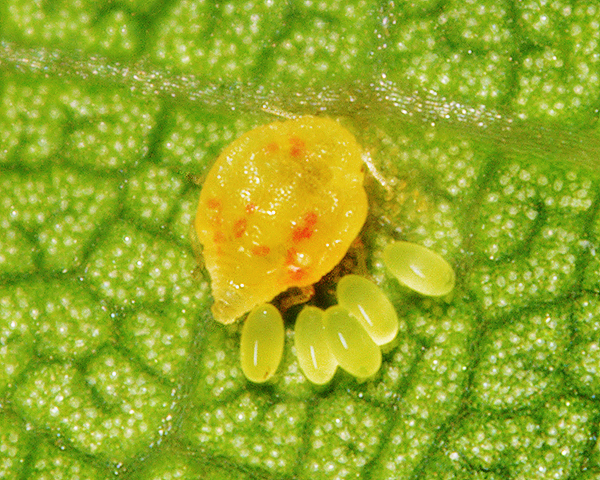 The first eggs are laid very close to the female. 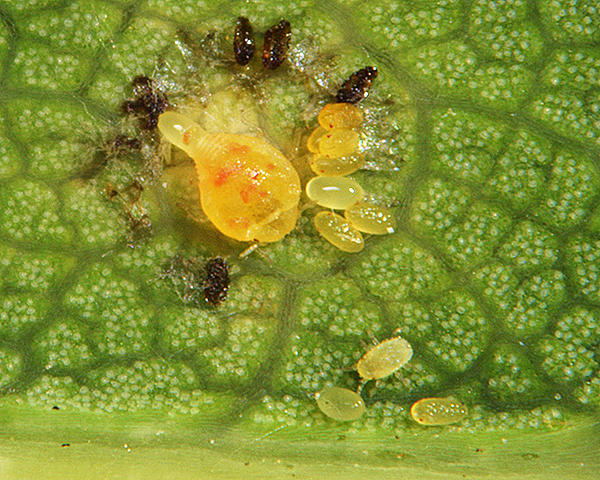 Once that circle is complete, the aphid backs up on to a previously laid egg and starts depositing another circle of eggs around the first (see picture below). Lubiarz (2001) found the number of eggs per female Phylloxera (Phylloxera glabra and Phylloxera coccinea) varied from 2 to 121. 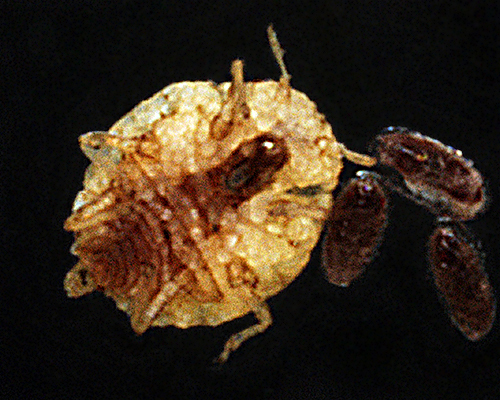 Phylloxera glabra is regularly preyed upon by the larva of the neuropteran Conwentzia psociformis (Blackman & Eastop (1994)). 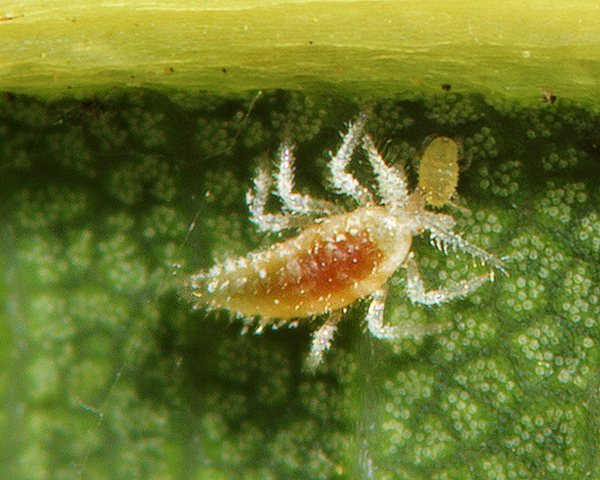 We found the neuropteran larva shown below feeding on Phylloxera glabra nymphs on an English oak leaf. It closely resembles other images of Conwentzia larvae. We also found eggs that had been killed in situ (see picture below), although we cannot tell if these deaths resulted from predators or a fungal pathogen. 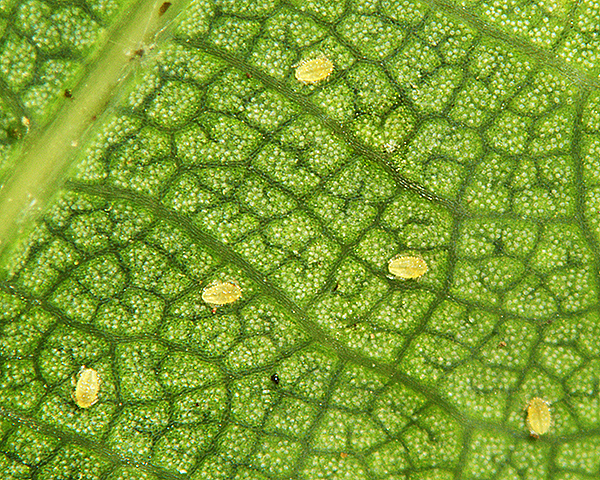 Steffan (1972) in Szentkiralyi (2001) reported that Phylloxera glabra were predated by larvae of various lacewing species including Chrysotropia ciliata, Nineta flava, Dichochrysa prasina and Sympherobius pygmaeus. 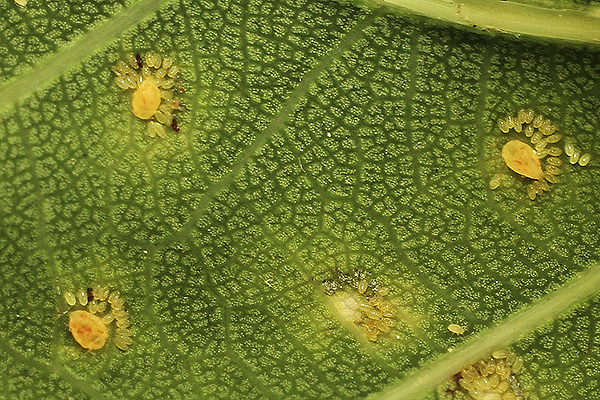 Phylloxera glabra has been recorded from 3 Quercus species (Quercus dentata, Quercus petraea, Quercus robur - and possibly Quercus infectoria). 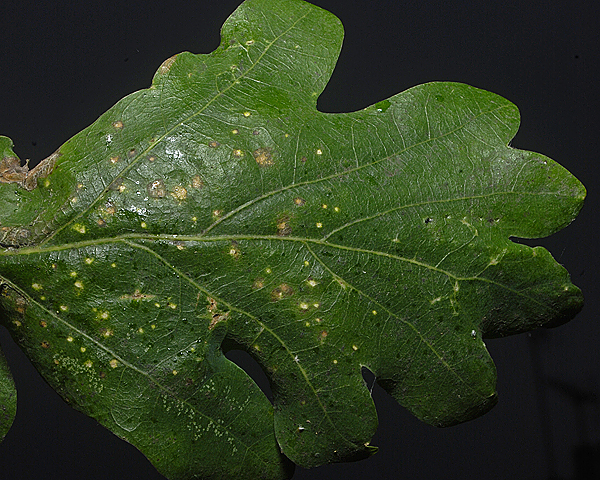 Of the 34 species on common or pedunculate oak (Quercus robur) Baker (2015) lists 15 as occurring in Britain: Hoplocallis picta, Lachnus longirostris, Lachnus roboris, Moritziella corticalis, Myzocallis boerneri, Myzocallis castanicola, Phylloxera glabra, Stomaphis quercus, Stomaphis wojciechowskii, Thelaxes dryophila, Thelaxes suberi, Tuberculatus annulatus, Tuberculatus borealis, Tuberculatus neglectus and Tuberculatus querceus. 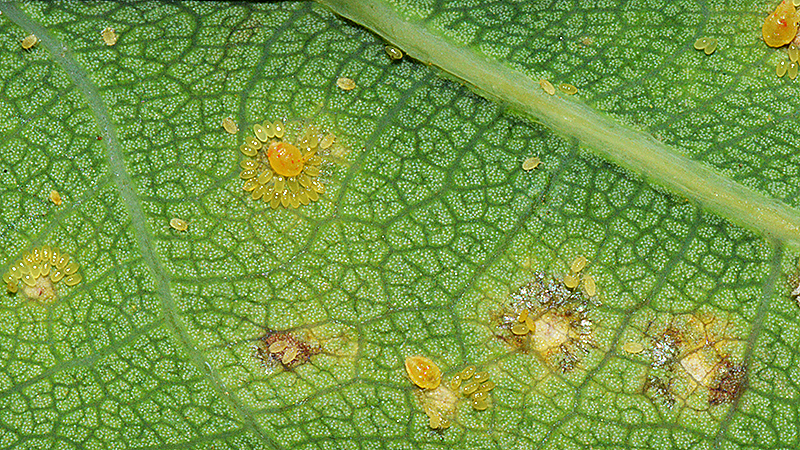 The underside of an affected leaf is shown below. Severe infestations can lead to a general browning of the leaves and premature leaf fall, but growth will only be affected in young trees. Our thanks to Alan Outen of the Bedfordshire Invertebrate Group for sending us photographs of Phylloxera glabra and samples thereof.